A collection of frequent topic requests. I research and take notes, looking for Aha! moments. Feel free to browse or join the discussion. Gimbal lock intuition: At the North Pole, all directions are South. No East/West anymore. Taxicab geometry (link). Learn to specify what a circle, ellipse, parabola, hyperbola are in terms of properties (vs. equations!). You can just write out the equations that give you the property you need. Usually just based on the distance formula. Antennas and beamforming - an antenna “scoops” the signal (and noise) from a volume of air. Crypto puzzles and work out ways to share (securely) using it. Gotcha: How x, x^2, x^3 are all 1-dimensional in math. Not “square units”, we’re just saying 9 = x^2, so x = 3 (1d) and x^2 = 9 (also 1d). Scenarios where getting to zero is winning (factoring). Neutral means you’ve won (you’re “on target”). i missed it? if not would be nice to be part of trig part2. Thanks, that one comes from the Pythagorean Theorem (mentioned briefly in the article). 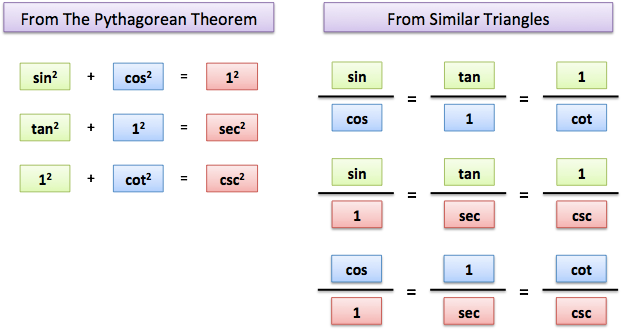 There’s a diagram here: http://betterexplained.com/wp-content/uploads/trig/trig-identities.png which might help. I’d like to do a trig part 2 with the other identities as well.